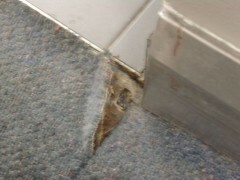 Recent reports on asbestos carpet underlay have indicated that carpet underlay may be contaminated with asbestos. The source of the asbestos carpet underlay is from recycling of hessian bags used to transport material from Wittenoom to Perth in the 1960’s and 70’s. When it is time to replace that old and tired looking carpet and you think it may fall in the right date (1960s to 1970s), then do not pull up the potential asbestos underlay yourself. Step 2: Should you find that you indeed have an asbestos carpet underlay, employ contractors with friable asbestos removal licence to remove and dispose of the asbestos carpet underlay for you. Similar hessian material found in asbestos carpet underlay can also be found to the hessian matrix within linoleum/vinyl flooring, thermoplastic tiles and even the bitumen glue used to bond the tiles to the floor.